I listen every day while on my way to work then catch the rest on podcast. My only complaint is Kathy... there are dozens of other people who could fill the token female role and would be better than her! Love the show and when I can’t listen live I listen to the podcast. Reason why I won’t give a 5 star is because of the edition job. A lot of times the same segment is played again and I’m listening to the thing twice in the same podcast. Listening to these guys since 2004. Best radio team in America ( I’ve lived in 30 different states) . Preston is mr cool. Steve is the smartest, quickest, funniest guy ever. I wanna see Steve at jeopardy. I love all of you I’ve been listening since y100 days and waited patiently for you to come back in the air. WMMR thank you I love this show long time listener. The pod casts are awesome it’s what gets me through the day!!!!!!!!! Sometimes I think there are too many guests. Especially comic guests. Other than that, I podcast everyday. If you live in the area and are not listening to the morning show you are truly missing out! They will keep you belly laughing all morning! The podcast is even better because it’s 90% talking way less commercials and no music which is what I prefer. They also have the best guests , mostly comedians which means MORE LAUGHING. Me being a DELCO girl myself Casey is my favorite 🤓 These guys have been working together for years , some as much as 20 years! The sense of family is evident and as you listen you tend to feel like you’re with your friends. Absolute best radio morning show! I’ve been listening for over 12 years and I can’t get enough! This is by far the best morning radio show in the country! If you're looking for a laugh for your morning commute then look no further. It's the most hilarious and thoughtful show or there. I dare you to listen for a full week and see how you can get hooked! These guys are the funniest on air and will make you bust out laughing while driving regularly. They also have some of the best interviews and are the most philanthropic people around. The downloads keep getting interupted over and over. Please fix. Been listening for almost 20 years! This is the best morning radio show in the country IMO. It would be 6/5 stars if they’d stop the annual Keenan’s broadcast to open the shore every year bc its terrible radio, but every other show is gold! Overrated they talk all over each other, jokes go way to long, hitting buttons when people talk. I’ve been an avid listener of the PnS show since around the time they transferred to WMMR(93.9). I ended up moving my life to South Florida in 2013. I had no idea the podcast existed to 2015 unfortunately. I am so glad I found it and have been listening to them down here daily(normally a day late) while I’m at work. They have consistently got better with age, like a fine wine lol. I was lucky enough to be in studio with them in the past as well as the string band I’m in, South Phila String Band, played in the “Spanksgiving Day Parade” for a few years. They’re just as funny and kind in person. Thank you guys and gals of PnS for entertaining ya day in and day out. Gadzooks. I’ve been listening to these guys/gals in and off for about the last 5 years. I honestly can’t remember the last time I played music while in the car. If you want a good laugh from start to finish this podcast is for you! I challenge anyone who’s on the fence to listen to 5 podcasts before you make up your mind. YOU GUYS ROCK!!!! It will never get better than this show. 100 stars! I've traveled and lived across the whole country. I haven't found a morning show even close to as funny and overall good as this one. I love this show. I usually listen live on the radio and end up missing the shows I don't catch. SO glad I decided to look into their podcasts so now I can listen to every single show. Anyone who isnt listening to this show needs to start ASAP. Your missing out. I listen every single day, man. If you're looking for a great weekday podcast or radio show with some real funny Philadelphia people YOU CAME TO THE RIGHT PLACE! 93.3 WMMR is by far the best rock radio station in the tri-state area. If I ever move away I'm definitely taking them with me! Much love for Preston and Steve!! Could not love them more!!! P and S. the best. I live in Michigan and I stream live in the morning and then listen to them again on the podcast. Been listening for over a decade - love these guys and Kathy. Do yourself a favor and listen! Quite simply, if you are not listening to these guys you are doing yourself a huge disservice! Whether or not you are in the broadcasting area you will fall in love with the Preston and Steve crew. Get on it! Give about 2-3 podcasts and you'll be hooked! Makes me wish I lived in Philly so I could call in. These guys are a blast. Came highly recommend by the great Todd Glass. I love the show!!! I live in Syracuse, NY and listen everyday via podcast. Thank you guys!! I have been listening to this show since the Y100 days. They are awesome and very entertaining. Love listening to the podcast while at work. Never been to philly but I've been listening to the podcast for years. Hands Down There's No Better Morning Show!! Somebody get my hair so I can go. I have been a long time listener of the Preston and Steve podcast. The whole crew is hysterically funny, but Steve especially is great. Love this and love listening to it daily. Haven't missed an episode since they started podcasts! I work crazy hours and all over the place do podcasting is great. I listen to P&S in Delaware, Jersey, Maryland, Pennsylvania, Maryland, Virginia, and North Carolina! Spreading the gospel of P&S all over the east coast! These guys are awesome !!!!!!!!!!!! Ladies and Gentlemen: introducing the greatest! Absolutely awesome! These guys are all that is right and good about Philadelphia. They are Philly's good will ambassadors to the world, and there has never been a finer group of people to fill the morning airwaves with riotous fun and tacky humor! I give them 5 stars only because there is no option to give them more! They're the best. Hands down. Never fails to make my day enjoyable. P&S rock. I love Preston and Steve. Listen on radio some show and rest on podcast after work. 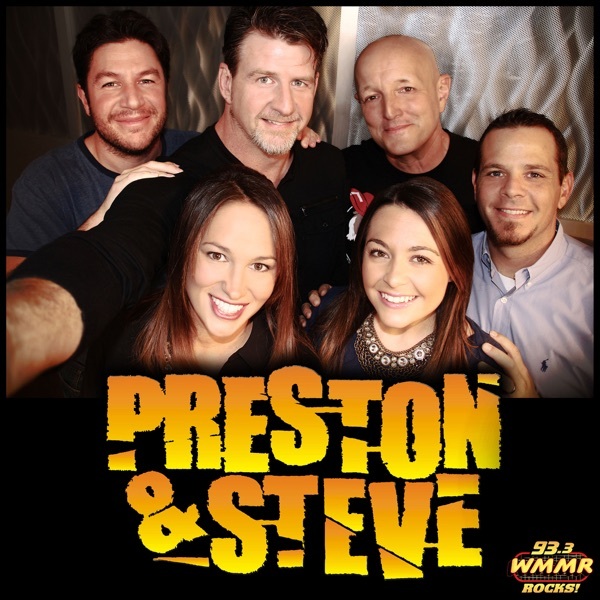 Every Philadelphian needs Preston and Steve on a daily basis. Best morning show ever you won't be disappointed !!!!!! I have been listening to Preston and Steve Since the Early 2000's and nothing had Changed!!! They are still Hilarious, down to earth, awesome people!!!! You Guys Roooocccckkkkkkkkk!!!! !